Waldkirch, November 2018 – At the Vision trade fair, SICK presented its Ranger3, a newly-developed 3D vision camera which is setting future standards in industrial 3D image processing when it comes to technology, speed, resolution and easy integration. 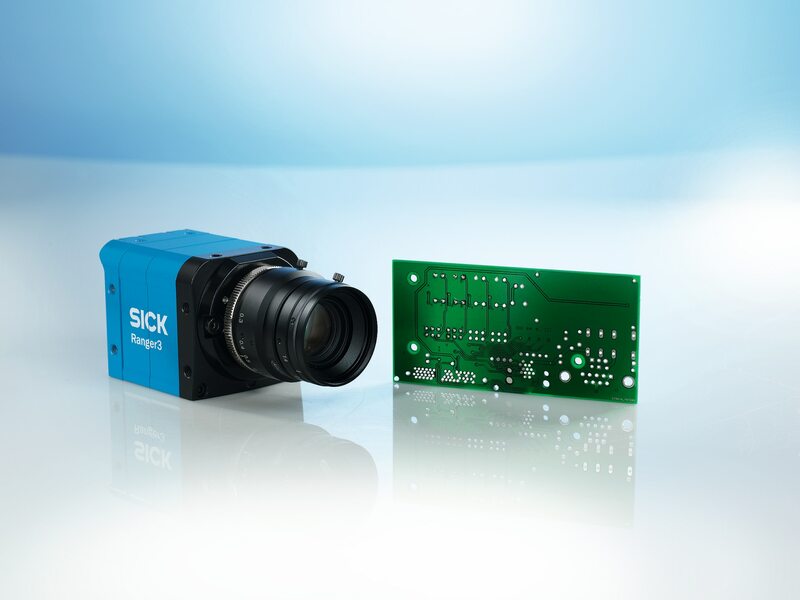 The streaming camera with the innovative ROCC technology (rapid-on-chip-calculations) developed by SICK can process up to 15.4 gigapixels per second, enabling full-frame 3D imaging (2,560 x 832 pixels) with 7 kHz. 3D object data is measured regardless of the color, contrast, the optical appearance of surfaces or the ambient brightness. The Ranger3 forwards the measurement data to an external PC via Gigabit Ethernet, using the established standards GenICam and GigE Vision. This makes integration easy for users, as in this way, the Ranger3 can be incorporated directly into image processing packages such as Halcon. The mechanical integration is also very easy, since the 3D vision camera, only 55 x 55 x 77 mm in size, not only saves a lot of space, but can also be configured optimally into different application-specific set-ups thanks to the exchangeable sensor components. The Ranger3 also satisfies the increasing demands on energy efficiency - the ROCC technology stands for comparably low heat generation, meaning active cooling is not needed. Higher throughput rates mean higher machine and process speeds. At the same time, the requirements on the precision of the measurement equipment in industrial image processing inspections systems are growing. Ranger3 has mastered this balancing act: 15.4 gigapixels per second and a resolution of 2,560 x 832 pixels speak for themselves. This performance enables absolutely accurate 3D measurements of many different object heights at frame rates which can keep up with the increasing speeds of production lines. The Ranger3 handles a wide range of object properties and application conditions when doing so: The innovative 3D algorithm finds the laser line on both the dark and light sections of an object and on different material surfaces, be they light or dark, matte or glossy. In high-speed applications, the high light sensitivity of the sensor enables shorter exposure times while ensuring the same level of precision in the measurement results. In contrast to the 3D vision solutions with FPGA processors or external frame grabbers, with the Ranger3, the 3D data processing takes place directly in the sensor with the ROCC technology: The CMOS sensor handles the conversion of the detected 2D laser line on this object in its exact 3D profile display. Extensive post-processing is avoided, the sensor becomes more compact and energy-efficient since excessive heat no longer builds up in the electronics and has to be discharged. On the other hand, this reduces the costs and complexity of the complete vision system - because the Ranger3 delivers complete 3D coordinates. The Ranger3 is designed for easy system installation and offers various options for application-optimized configuration at the same time. The ProFlex concept contains exchangeable modules including a wide range of lenses, lens covers with enclosure ratings IP65 and IP67, replaceable threaded filters, and multiple Scheimpflug adapters. This allows the Ranger3 to adjust and optimize the focal length for each specific set-up to ensure that the entire object height can be recorded perfectly. When it comes to integration into the electronics and measurement equipment, the Ranger3 fulfills the requirements of vision system manufacturers who would like to integrate their systems into vision solutions with conventional image processing libraries using software interfaces. Here, the Ranger3 uses established standards GigE vision and GenICam for gigabit Ethernet data transmission. This makes it possible for the streaming camera to be incorporated directly into image processing packages such as Halcon. SICK is one of the world’s leading producers of sensors and sensor solutions for industrial applications. Founded in 1946 by Dr.-Ing. e. h. Erwin Sick, the company with headquarters in Waldkirch im Breisgau near Freiburg ranks among the technological market leaders. With more than 50 subsidiaries and equity investments as well as numerous representative offices, SICK maintains a presence around the globe. In the fiscal year 2017, SICK had almost 9,000 employees worldwide and achieved group sales of around EUR 1.5 billion. Image IM0073851: The Ranger3 is a newly-developed 3D vision camera which, thanks to SICK’s own ROCC technology (rapid-on-chip-calculations), is setting new standards in industrial 3D image processing when it comes to technology, speed, resolution and easy integration.